Hay Hutches were invented and designed by horse owners and enthusiasts. We sincerely aim to try to improve your feeding management and help reduce costs and save time. If you have any suggestions or comments please email us using the link on the Contact page. We accept Visa and Mastercard credit and debit cards, PayPal and internet bank transfer. In the case of bank transfer, we reserve the right to wait until funds have cleared before goods are despatched. Assuming you enter a valid e-mail address, confirmation of your order will be sent automatically, This confirmation e-mail should be adequate for accountancy and VAT purposes. If you require a formal invoice, please let us know. Shipping And Handling We will arrange delivery and e-mail the delivery details to you. Delivery Schedule We endeavour to dispatch your order right away. UK orders should reach you within 3 to 4 working days. In the unlikely event that we are out of stock, please allow up to 10 working days. European mainland and UK island deliveries take longer. Please allow 14 working days. Guarantee We are keen to see our customers expectations satisfied. If you experience any problem with your Hay-Hutch or have any queries, please do not hesitate to call us on 01985 840374 or e-mail us at info@hay-hutch.co.uk. In the unlikely event of a Hay-Hutch failing due to faulty manufacture within two years of delivery, we will be happy to replace it or offer a refund. 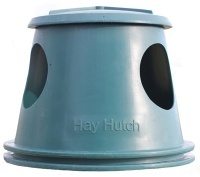 Please note that Hay-Hutches have been tried and tested with a variety of horses since 2006. We have never had any injury caused to a horse nor any significant damage to a Hay-Hutch. If, however, you have a horse that is known to paw excessively or has other recognised destructive habits, we recommend that you observe its behaviour for a period when first confronted with a Hay-Hutch. 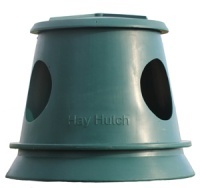 Hay-Hutches are not recommended for anything other than fodder, e.g. hay or haylage. This statement is in no way intended to alter or interfere with your statutory rights.